With Hurricane/Tropical Storm Bud approaching this week we had some clients reschedule their trip in the beginning of the week. That left us with some time for some maintenance, cleaning and time to prep for the storm. Bud came and went and fortunately was not too bad. We headed out this morning with a group of guys from Southern California. The swells were still up some from the storm. We found some weed lines but the storm dropped water temperatures down 7°, so off to some of our favorite spots to bottom fish it was. Right off the bat they got a good cabrilla (grouper), then several other groupers. The fight of the day came when an amberjack struck the mackerel like a freight train. It was a solid fight that had our customer wore out after. The waters calmed down as the day went on, we hope the temperatures climb back up this coming week. Yesterday and today we had clients that wanted to get dorado, we left Puerto Escondido early in the morning both days hoping to fulfill their wish. We were on a direct mission to find dorado. We trolled feathers as we looked for any possible sign that would lead us to the dorado. We were getting into water temps ranging from 80-89º in the warmest spots, we were seeing more flying fish than in previous days so we were sure it would be a good day. We searched long and hard both days. We finally started to find small pieces of kelp (sargasso) which led us to very large patties, yesterday we found the dorado!! Unfortunately we were not lucky enough to get the bite. Today we were back on some more patties as well but the dorado weren't home. The anticipation is killing us because it's going to be any day until we are landing them! After coming off several windy days we found ourselves chasing a tough bite. We fished several locations today but only managed to put a few on board. Hoping things start to turn around for the better but with storms approaching from down south we will just have to wait and see. A nice fresh caught dinner was had by all though! Mother nature was against us here today in Loreto, we headed out after advising our clients that the wind was not looking to be good and would be wise to reschedule for later in the week. We arrived at our destination and the wind was howling and the Sea of Cortez was choppy as could be. We landed a good size grouper pretty quick and they decided the conditions were too much, so we headed back to Puerto Escondi. We are hoping the weather calms back down for everyone. Today we were back on the waters of Loreto for day 2 with the same group. Water temperatures are slowly climbing, today the Sea of Cortez was knocking on the door of 80ºF. We were unable spot any dorado but we did get into a good amount of grouper (cabrilla), a few snapper (pargo), enough triggerfish for some ceviche for tonights appetizer, more importantly found some yellowtail which have been harder to lock in on this season. Overall it was a good day of fishing with tight lines most of the day. 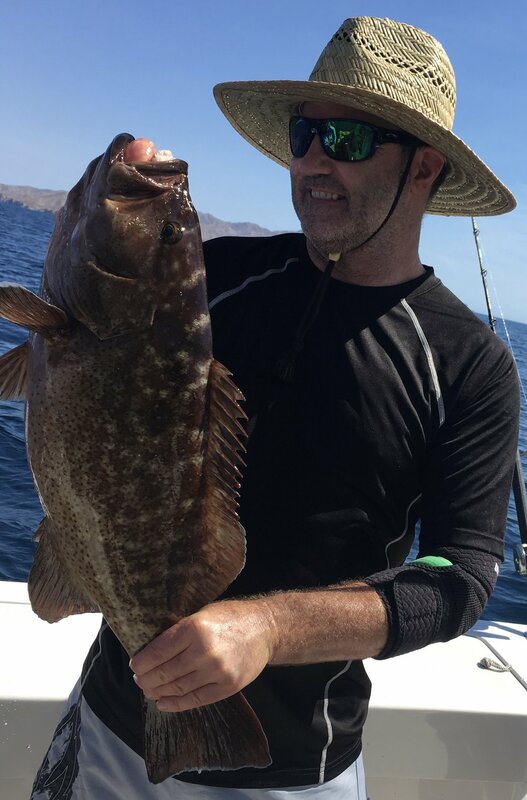 To start off the month of June in Loreto we headed out for a day of offshore fishing. The weather was slightly windy and water temps are still slowly rising. We spotted several good size kelp patties unfortunately today there were no dorado home. We continued our way out further into the Sea of Cortez to some quality spots. We ended up getting into several grouper (cabrilla), some decent snappers (pargo) and some large triggerfish. We are expecting that any day the dorado will becoming in larger numbers to these spots. 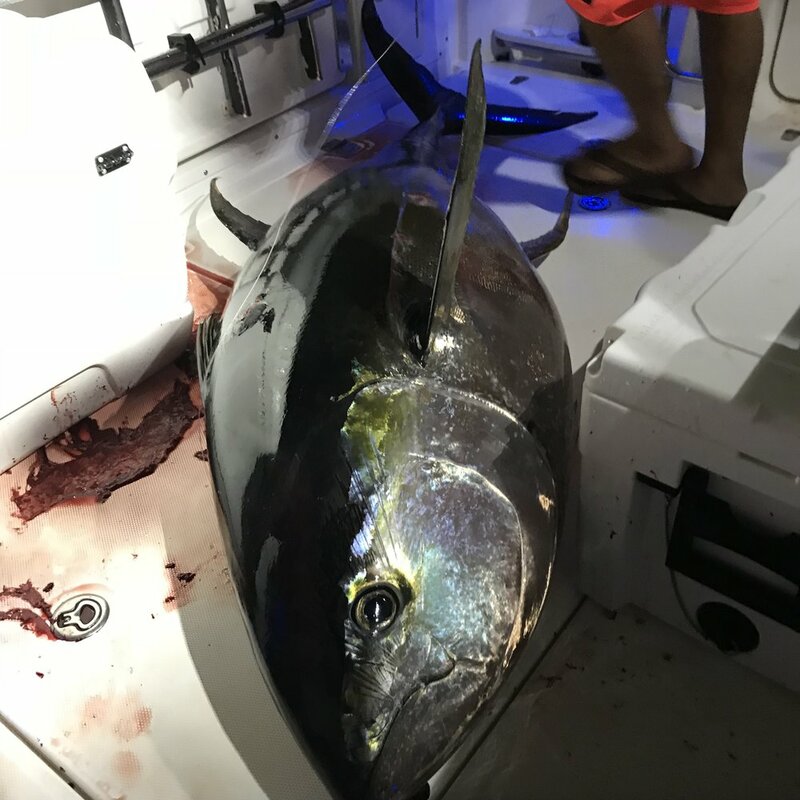 424.6 pound yellowfin just three pounds off all-tackle mark, is a pending 50-pound line class record; Huge tuna of 424.6, 319, 212.5 pounds are caught in three days at El Seco, a pinnacle south 50 miles south of Puerto Escondido. LORETO – It’s wintertime in Baja. You don’t often see huge tuna being caught off Cabo, and you sure don’t see many big cow tuna being caught off Loreto in the news. That might be because you haven’t been paying close enough attention all these years. For most people, waters of Loreto are an outpost for big game fishing, the region better-known for its summer dorado fishing under floating sargasso grass and winter homeguard yellowtail action on reefs off Coronado and Catalan islands. The reality is that Loreto and Puerto Escondido are jumping off points to some of the best big game fishing in the world. To be more specific, the playground for big gamers is El Seco, a conical mountain, a pinnacle rising from 2,500 feet deep to a mere 14 feet or less, is located about 10 miles southwest of Catalan Island. At various peak times, it attracts swordfish, black marlin, blue marlin, wahoo, and big tuna. This year the big tuna are early. Timing is everything. The beauty of the spot in terms of yellowfin tuna is you can anchor on it, and chunk frozen squid. Jay Yadon owns Outpost Charters (www.outpostcharters.com). His father-in-law is Robert Ross, a Cabo native, champion motocross rider in his youth and a Newport Beach and Mexico real estate developer who is a big game sportfisherman and regularly fishes El Seco on his 37-foot Boston Whaler Rampage he runs from a quiet anchorage below a hillside home he built to the south of Puerto Escondido in an isolated town north of Aqua Verde. He picked that spot for a 10-room home overlooking the Sea of Cortez because it is undeveloped and a mere 11 miles from El Seco, and best of all, a natural estuary below provides safe anchorage. Two years ago WON did a feature on Robert Ross when he caught a 450-plus pound yellowfin he did not weigh on a certified scale, although he did weigh it on a cattle scale after being gutted, and it weighed 430 pounds, but he measured it. It would have easily been the all-tackle record for yellowfin. He told WON at the time he has no desire to set any records. He just likes to catch big fish, and El Seco is a target-rich environment. He seems unconcerned about a secret getting out. The spot is far too isolated to be impacted by fleets and the big tuna and other big game species have their own schedule. Yadon started Outpost Charters just after he moved to the area two years ago. El Seco is a prime charter spot for customers, and while Ross is not concerned about records, Yadon knows they are a great calling card. 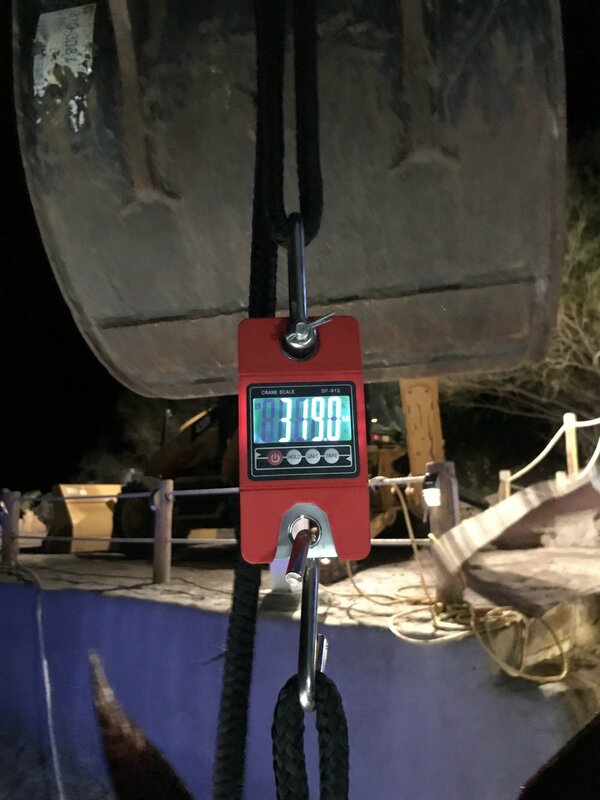 Thus, Yadon and Outpost Charters invested in two certified digital scales obtained through a friend, IGFA rep Chris Wheaton who directs the Loreto Fishing for the Mission charity tourney. Those scales came in handy over three days. 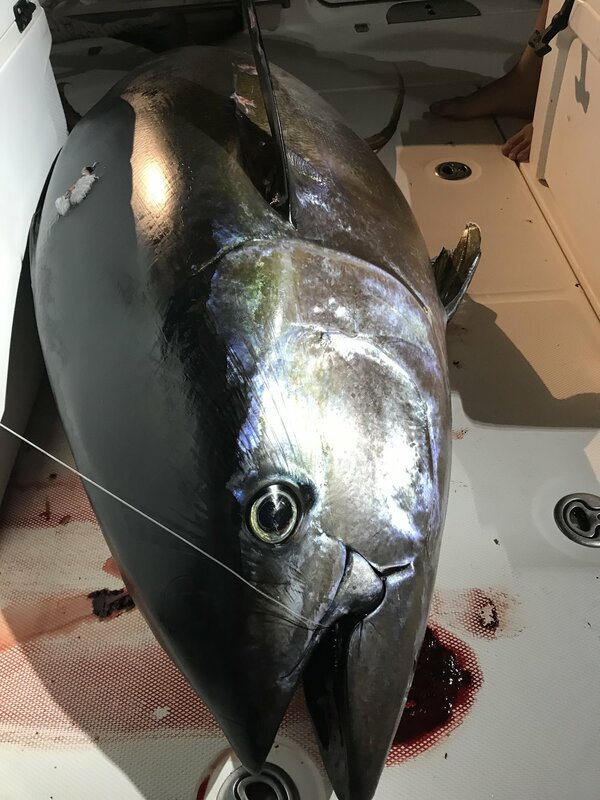 Anyway, when the big tuna are on El Seco, Yadon and Outpost Charters captains are alerted by local commercial pangeros who anchor on the shallow spot for smaller game. Yadon and Ross heard the tuna were on the reef late last week, the weather has been good, and he went out Saturday with Ross and crew on the Cast N Reel, a 40-foot Luhrs, one of the three charterboats based out of Puerto Escondido, a picturesque, natural harbor located 15 miles south of the town of Loreto. The bay is located 50 miles from El Seco. Two boats fished as buddy boats all three days. Ross employed his sport fisher and the crew moved between boats on the three days of crew trips. The first day on the bank, Yadon and crew on the 40-foot Cast N' Reelanchored on the spot and began chunking frozen squid, and after 20 minutes a 212.5 pounder responded, and was caught on one of the two big outfits with Okuma 50W reels and Seeker custom rods. They rushed home to Puerto Escondido, posted some pictures on FB and sent some details and photos specifically to this reporter. Yadon said that night, Saturday, that winds had picked up and while he wanted to get out there again Saturday night, he waited until morning to head out again. On the boat was Jorge Lazo, a crewman with Outpost Charters and who like Yadon, is a son-in-law of Robert Ross. 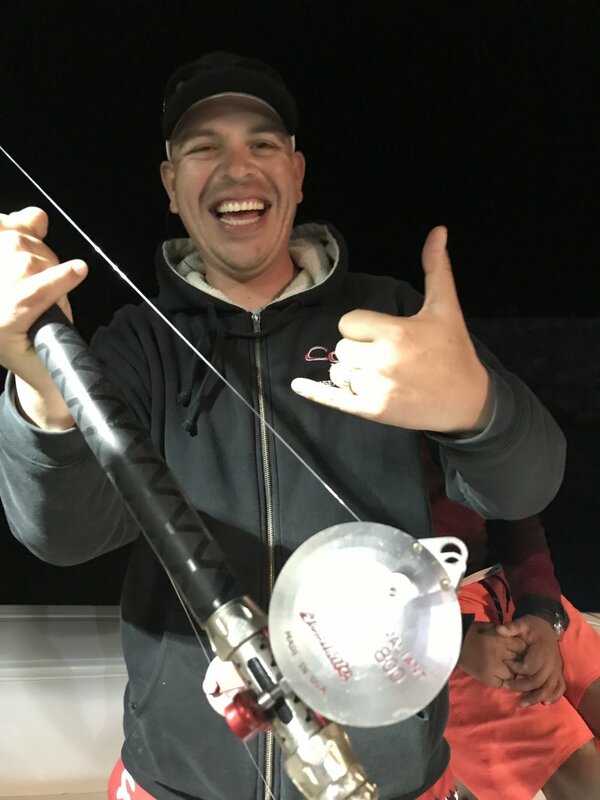 “We had set up a chum line for a couple hours with the heavier gear (Okuma Makaira 50 wide reels with 100-pound P Line and 100-pound Hi-Seas pure flourcarbon),” said Yadon, who said Lazo was looking for a big yellowtail that had been caught there recently. And after the mackerel was slammed, they thought it was a big yellow. “Jorge got 20 cranks on it, and then the fish figured out what was happening, and took off.,” said Yadon. “He was using 60-pound P-Line on an Accurate Valiant 800 and a Seeker rod, and was flylining a mackerel with a 6/0 Mustad hook. Super light gear, and the battle went on for 2 1/ hours resulting in the 319 pounder. 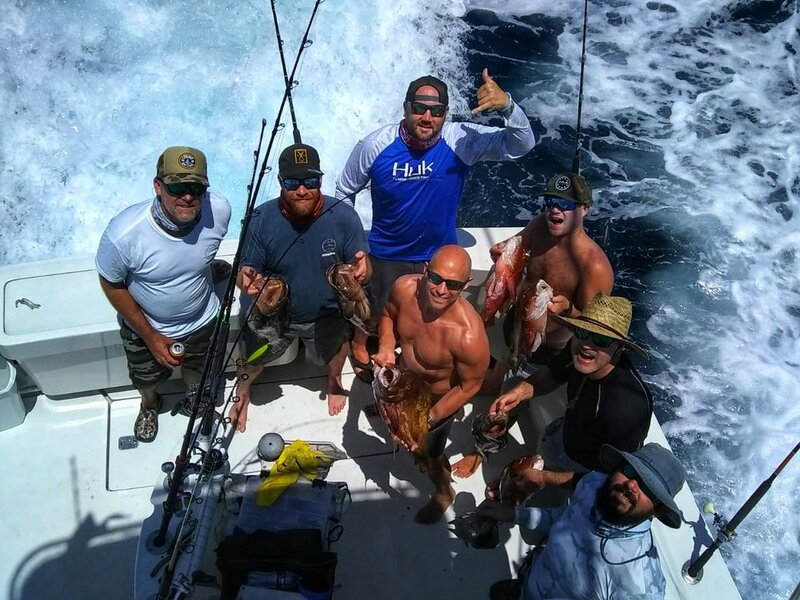 They thought they had a line class record, but there is no 60-pound IGFA line class for yellowfin, and the record for 50-pound line they learned from rep Chris Wheaton back in the States was 285 pounds. So Lazo re-rigged the Valiant 800 with 50-pound line and 100-pound Hi-Seas’ pure fluorocarbon leader to go after the line class record the next day. 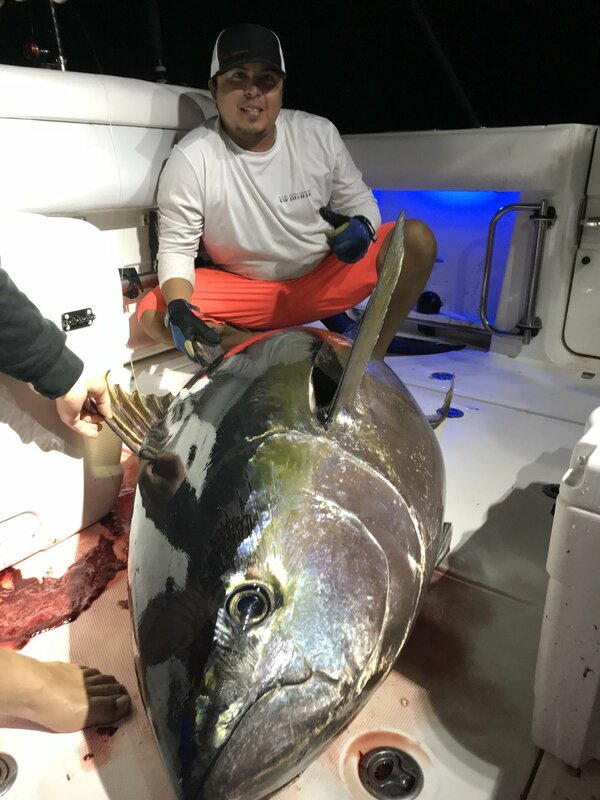 Sure enough, the two boats went out and Lazo, fishing on Ross' boat, hooked up with another big fish at El Seco on Monday, again using a mackerel over the chum slick to get the one he wanted for the world record on 50-pound line. The 424.6 pounder was gaffed after a battle of one hour and forty-five minutes in stand up gear. The fish was just three pounds off the all-tackle world record. 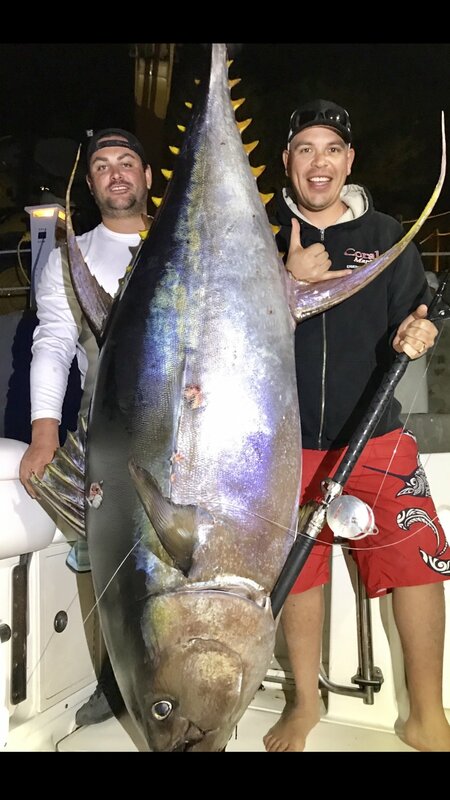 If the catch is submitted to the IGFA, it would obviously be the 50-pound line class record and would be the second biggest yellowfin ever caught on rod and reel that was weighed on a certified digital scale. The 427-pound yellowfin all-tackle record yellowfin will remain in the possession of Guy Yocum, caught in 2012 on his sport yacht El Suertudo on a multi-day trip out of Cabo. By Monday night, the winds were cranking, and it took seven hours to get back to Puerto Escondido 50 miles northwest with the huge fish. This week the winds will blow, Yadon said. But by this Monday Outpost Charters will be back out at El Seco. The big fish are likely to still be there. “Coming here this early, I think they will stick around a while,” said Yadon. In other Baja action, there was a Cabo yellowfin of 322 pounds on 40-pound line, plus wahoo, football-sized tuna, and dorado are still in the mix in Baja Sur with 77 degree water at the Cape; San Quintin yellows are BIG! Ensenada also kicking out yellows. Second day in a row we found the giant yellowfin tuna out of Loreto. We set up just like we did yesterday. We set up on the anchor and started chunking squid. The biggest difference this time was the fish came up on a live mackerel and took angler Jorge Lazo for a ride. It was caught on an Accurate Valiant 800 with 60 pound test and 100 pound leader. These size fish are only in Loreto for a limited time so we were really happy to land this big boy. He weighed in at 319 pounds even. Today was an incredible day on the water. We left Puerto Escondido around 5:30 on the hunt for giant yellowfin tuna. We had some report from local commercial fisherman that had seen some crashing on the surface the day before. We got set up on our spot and started chunking squid. Around 11:30 in the afternoon we were hooked up. We ended up landing a 212.5 pound yellowfin tuna. The fight took about an hour and was caught on a Seeker custom rod and Okuma Makaira 50w with 100 pound Hi-Seas leader and 80 pound test. Great day of fishing in Loreto for tuna. We had an epic day being on the water in Loreto. We left out of Puerto Escondido Marina and ventured out into the Sea of Cortez. Passing two of the Islands of Loreto Isla Monserrate and Isla Santa Catalan we had an encounter with a humpback whale, so was great to have the chance do some whale watching on our way to do some offshore fishing. As we were trolling around we spotted some marlin that we casted some baits to but they just weren't hungry enough at that time. No too long after we had a dorado strike one of our jigs and we were able to land that fish. As we continued trolling through the waters of Loreto our Captain spotted birds in the distance so we made our way towards them and sure enough we found ourselves in a school of yellowfin tuna. A great time was had by all landing these powerful fish. After the bite turned off we made our way back to the marina but not before we had many dolphins putting on a show for us which was a perfect way to end an amazing day. The fishing in Loreto has been incredible lately. Check out these catches. Another great day of fishing in Loreto Baja Mexico. Another awesome day fishing in Loreto today! We left out of Puerto Escondido around 7am and traveled South around Isla Catalan. We were fishing a high spot around the island and found a lot of yellowtail, grouper, and snapper. The family we were with had never been fishing in Loreto before so needless to say they were very pleased with all the fish we caught. The fishing around the Loreto area lately has been very consistent and holding a lot of fish. The weather was perfect today with almost no wind and 80 degree temperatures. All of the fishing we did today was bottom fishing. We ended up with limits on out fish by around noon and headed back to Loreto to enjoy the rest of the day by the pool. If you are interested in fishing in Loreto please give Outpost Charters a call to book your trip today. Today was a great day fishing in Loreto. Outpost Charters took a family fishing offshore. We fished the Islands of Loreto around Isla Catalan. The weather was very nice with just a slight breeze. This family had a great time catching fish all day long! We were fishing on a high spot with mackerel on the bottom. We caught limits on yellowtail, snapper, and cabrilla. The kids even got to catch a lot of fish themselves. We had a great time taking this fmaily fishing and hope the visit us in Loreto again soon. Today was another great day of fishing out of Loreto, Baja Mexico. We caught a ton of fish and had a blast fishing the Sea of Cortez. We had a great group of guys visiting Loreto from Southern California. They chartered our 40; Luhrs named Cat N' Reel and we left Puerto Escondido around 7am. We loaded up the boat with the customers and crew and headed about 30 miles offshore to fish the South part of the islands of Loreto. From the second we arrived to the high spot we usually fish we were hooking up. The weather was perfect all day and the water was very blue. We were fishing live bait on the bottom and ended up having the best day out of any boat fishing out of Loreto. Our total fish count was 15 yellowtail, 5 cabrilla, 2 pargo, and 1 amberjack. The customers were happy and so was the crew. We could not have asked for a better day fishing out of Loreto. Today was an amazing day fishing on the Sea of Cortez. We had a great group of people with us including local Loreto legend Augie as well as many other locals and friends. The group chartered us to fish the outer islands of Loreto. We spent most of the day fishing a high spot we frequent just south of Catalina Island. Today was mostly bottom fishing with live bait at around 120 ft. A lot of the time when fishing in Loreto you can get some nice sized yellowtail fishing the bottom. Total fish count for todays trip was 10 yellowtail, 1 amberjack, 2 cabrilla (seabass) and 3 pargo (snapper). Overall you could not have asked for a better day fishing on the Sea of Cortez out of Loreto. Weather: The weather was perfect with a slight breeze. Misc: Great day on the water enjoying the Sea of Cortez. Weather: The weather was amazing. Catch: We caught our limits on Dorado and a few really nice bulls. Misc: Loreto fishing charter clients had a great time today and I can't wait to have them back. Catch: We caught 14 dorado!